CHESTNUT HILL, Mass. - The No. 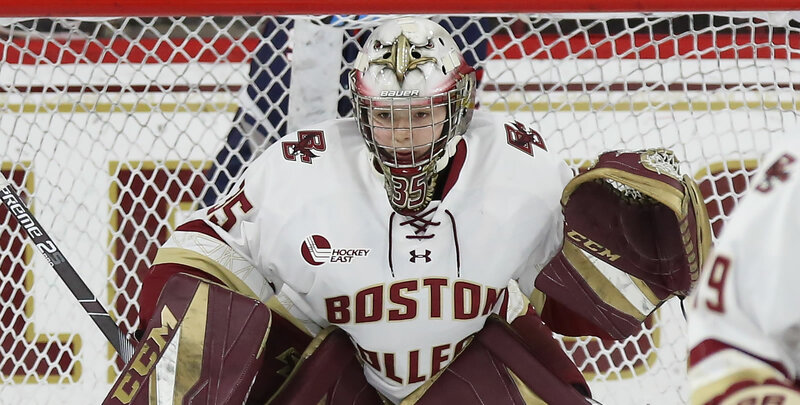 7/7 Boston College women's hockey team had six different goal scorers and a 16-save shutout from Maddy McArthur en route to a 6-0 win over Holy Cross on Friday night at Kelley Rink. Serena Sommerfield, Kali Flanagan and Kelly Browne each finished with three points while eight players total registered at least one point in what was the sixth consecutive win for the Eagles. Goals from Daryl Watts and Sommerfield in the span of 31 seconds gave the Eagles a 2-0 lead after the first period. BC then put home three goals in a five minute span in the middle frame before Caitrin Lonergan's 13th of the season midway through the third period capped the scoring. McArthur made nine saves in the first period to keep the Crusaders off the board then went on to finish with 16 for her fifth shutout of the season. Jada Brenon finished with 26 saves in two periods of work while Julia Pelletier made 16 over the final 20 minutes. The Eagles had a 48-16 edge in shots on goal. Neither BC (0-for-3) or Holy Cross (0-for-2) converted on the power play. February 1, 2019 | 6 p.m.
Kelley Rink at Conte Forum | Chestnut Hill, Mass. 1st, 11:20 | 1-0, BC GOAL: Flanagan corralled a Holy Cross dump-in attempt and slid a pass to Watts coming off the bench. The sophomore skated in on three defenders down the left wing, deked through the stick of one to get free and then made Brenon go down before lofting a backhand at the right post. 1st, 11:51 | 2-0, BC GOAL: Browne fed Sommerfield in the right circle for a one-timer that deflected off a defender and popped up over Brenon. 2nd, 13:34 | 3-0, BC GOAL: Sommerfield took a shot from the top of the slot that bounced off the end boards to Watts camped out at the left post. Watts pushed the puck across the goal line and Agnew got it on the other side to flick home. 2nd, 15:21 | 4-0, BC GOAL: Flanagan lofted a puck from BC's blue line towards the other blue line on the left wing and Ryan Little skated on to the puck around the defender and wristed a shot over the shoulder. 2nd, 18:48 | 5-0, BC GOAL: Lonergan regrouped below BC's blue line and skated down the left side of the ice. When she hit the face-off dot, she slid a pass to Browne at the hashmarks for a one-timer that found the upper right corner of the net. 3rd, 13:37 | 6-0, BC GOAL: Lonergan pushed the puck ahead through two defenders and Pelletier tried to handle it but Lonergan took advantage of a miscue and calmly slotted the puck home from the right circle. - BC is now 3-0-0 all-time against Holy Cross with a mark of 1-0-0 at Kelley Rink. - Caitrin Lonergan has now registered at least one point in six straight games. - With her 58th career goal, Lonergan moved into a tie for ninth place all-time in program history with Andie Anastos. - Daryl Watts' tally was the 57th of her career, good for a tie with Dana Trivigno for 10th all-time in program history. - It was also Watts' sixth career game-winning goal, moving into a tie for 20th all-time in program history. - Maddy McArthur earned her fifth shutout of the season, which ties for the national lead ... her 18 wins lead all rookies and is tied for second in the country. - Serena Sommerfield tied a career-high with three points, matching a 1-2-3 outing against New Hampshire on Jan. 1, 2018 ... the senior now has points in four of the last five games. - Kali Flanagan's three-point outing was her second of the season and fourth multi-point game of the season ... her three assists tied a career-high. - Kelly Browne's three points on one goal and two assists mark a new career-high ... the rookie has four multi-point outings on the year. - Makenna Newkirk finished with a game-high 15 face-off wins ... BC had the overall 30-14 edge. - Lindsay Agnew finished with a game-high eight shots on goal. - BC has out-shot the opponent in 17 consecutive contests. - This marked the fourth time this season that the Eagles have had five different goal scorers in a game and the first time since a 6-2 win against Harvard on Jan. 16, 2018 that BC had at least six different goal scorers in a contest. - The Eagles have scored at least four goals in the last six contests...it's the longest such streak for BC this season and the longest since a six-game stretch from Dec. 2, 2017-Jan. 7, 2018. Boston College will take on Harvard on Tuesday, Feb. 5 in an 8 p.m. Beanpot semifinal game at the Bright-Landry Center.